OBJECTIVE: Compel people to watch the Ken Burns documentary on WWI: a fresh perspective on war. SOLUTION: The film showed the impact WWII had on small town Americans plus soldiers overseas. As the writer / CD, I distinguished it from other war films by showing powerful, historic photos of citizens juxtaposed with war jargon. This quickly helps convey a powerful, emotional impact on both fronts. EXECUTION: “Grenade” features a candid photo of a grief-stricken mother receiving a telegram that her son has died at war. COPY: World War II was overwhelming for the home front—especially for a grief-stricken mother who just lost a son. 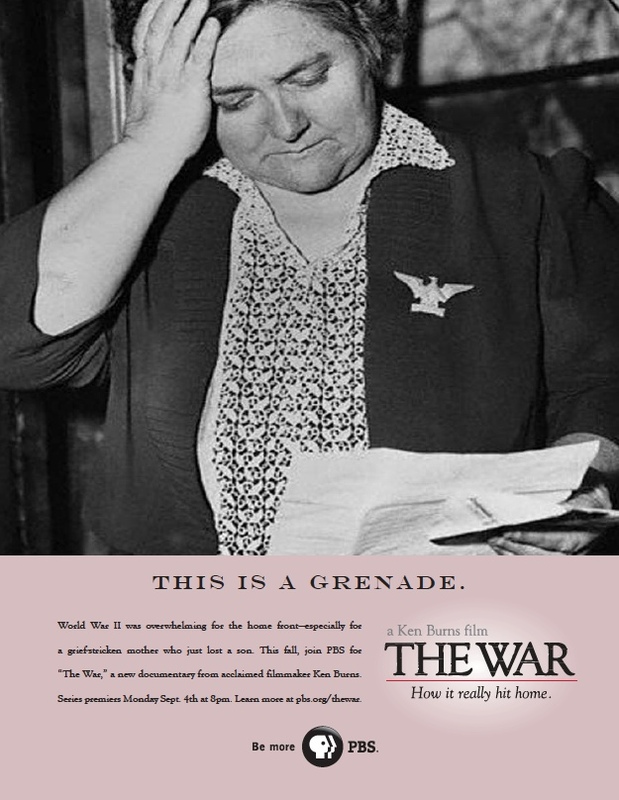 This fall, join PBS for “The War,” a new documentary from acclaimed filmmaker Ken Burns. Series premiers Monday Sept. 4th at 8pm. Learn more at pbs.org/thewar.